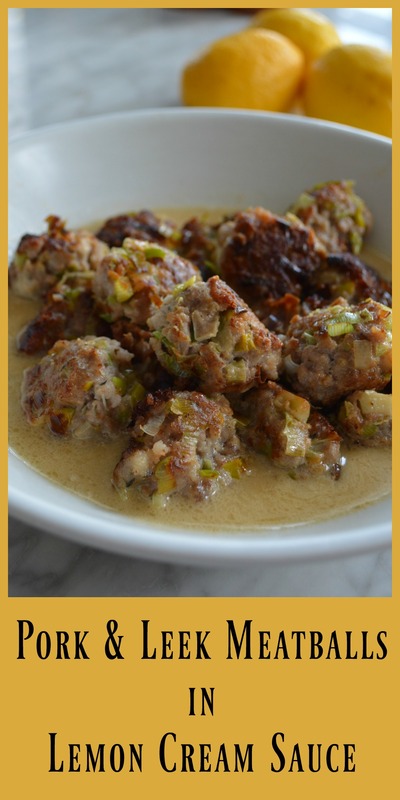 Like many great recipes, these AIP-friendly pork and leek meatballs came into existence by accident. I actually thought I had grabbed a package of frozen lamb out of the freezer and was going to make an entirely different dish, but when I realized I actually had ground pork defrosted and ready to go, I started improvising. I’ve become a big fan of meatballs over the last few years, in part because ground meat is one of the less expensive ways to consume humanely and pasture raised pork or grass fed beef. The potential flavor combinations are endless, and provide a great way to sneak in some vegetables! In this recipe however, the leeks aren’t hiding! As you can see in the picture, they are front and center, where they belong. While this makes for an incredible flavor, it does lead to a more fragile meatball, which is why I added some coconut flour to help bind them together. Make sure you clean your leeks carefully to remove any grit. Not sure how to do that? Here is a good tutorial. Be sure to use a coconut milk without any additives. This is my favorite brand. If you don’t want to make your own bone broth, take a look at this post that reviews store bought options. This sauce tastes best with the wine and as long as you let the alcohol cook off, it is compliant with healing diets. However, if you’d rather not use alcohol at all, just substitute bone broth. Paleo autoimmune protocol (AIP) – Compliant with the elimination phase as written. If you have reintroduced black pepper, feel free to add it to your taste preference. Specific Carbohydrate Diet (SCD) – Compliant as written, just make sure you use a dry white wine. Low-FODMAP – Use only the dark green part of the leeks. 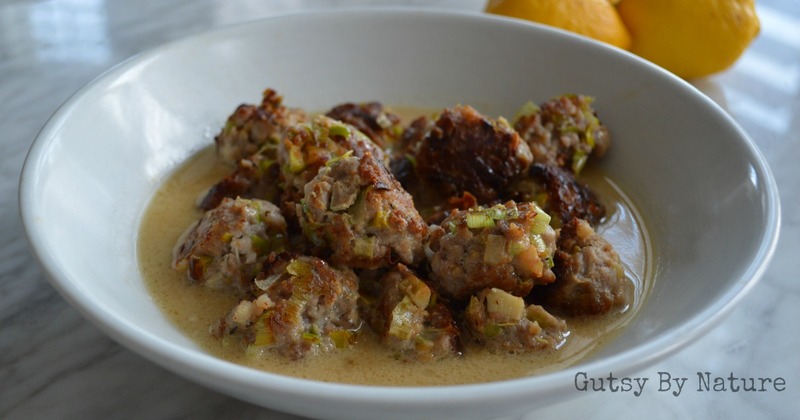 Ground pork and leeks combine to make an AIP-friendly meatball that is tender and tasty. Lemon cream sauce makes it elegant enough for a fancy dinner! Heat ½ tablespoon coconut oil in a skillet over low-medium heat. Add leeks and cook until soft (about 5 minutes). Transfer the leeks to a bowl and add ground pork, thyme, coconut flour, salt, and half of the lemon zest. Mix evenly, using your handles. Shape mixture into approximately 16 meatballs. Add other ½ tablespoon coconut oil to skillet over medium-high heat. Add the meatballs and cook until browned and cooked through (6 minutes), turning periodically so they can brown on all sides. Remove meatballs and set aside. Pour wine into pan to deglaze, using a wooden spoon to scrape up browned bits. Cook until reduced by about half (about 3 minutes) then add broth, coconut milk, remaining lemon zest, and lemon juice. Cook until simmering. Return meatballs and allow to warm through. Delicious and easy! I made this last night. I subbed scallions for leeks since that’s what I had on hand. The lemon cream sauce would also be great with some greens. Yum.